More technically named Low Level Laser Therapy (LLLT), this revolutionary treatment utilizes photons of light to augment the body's natural healing abilities. LLLT has been proven to be safe, effective, and painless and is used to treat both acute injuries and chronic pain. Treatment with the ML830 stimulates the cells in the body that repair tissue, reduce inflammation, and reduce pain. This laser is different from what most of us picture as a laser. The MicroLight ML830® Laser is a handheld, noninvasive, light-emitting, medical device. It was first cleared by the FDA in 2002 for carpal tunnel syndrome treatment, based on research conducted at General Motors in 1995. Because it emits non-visible light that has no heating or cutting properties, it is called a Cold laser. absorbed by the outer layers of skin, creating heat and often damaging tissue (much like a bad sunburn). 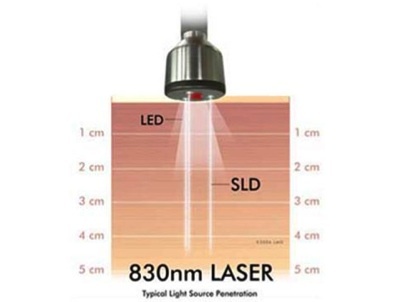 The ML830 Laser emits light at a wavelength of 830 nanometers, which is unique in allowing deep penetration without a thermal or heating effect. This enables the cells to heal and repair themselves at a greatly accelerated rate. Microlight Corporation (the manufacturer) patented this particular wavelength because it provides the deepest penetration among all low level lasers. It is also the only wavelength currently approved by the FDA. ♦ Reduced Pain - Most conditions require 6-12 treatments for maximal alleviation of symptoms. Chronic conditions may require more. Pain reduction is achieved by increasing the level of endorphins in human tissue, as well as normalizing the action potential of the involved nerves to -70mV (normal) from a hyper excitatory state. 	The lymphatic system is stimulated to help remove waste products and cellular debris from the site of tissue impairment. 	NO (nitric oxide), histamine, and serotonin production are stimulated to produce a non-thermal vasodilatory response, improving circulation in the injured tissues. 	Angiogenesis (creation of new capillaries) is promoted which increases the rate of healing as circulation is improved. 	Cells become more permeable, which allows injured cells to take in oxygen and nutrients at a level similar to that of a healthy cell. This helps injured cells to release wastes and toxins, which in turn decreases healing time. Photons from the laser can donate photons to the injured cells mitochondria. This can then enhance the production of Adenosine TriPhosphate (ATP), chemical energy required for healing and rejuvenation. ♦ Increased Tissue Strength  ML830 Laser increases both collagen and fibroblast activity. Professional athletes use this therapy to heal injuries faster. Laser treated tissues are stronger after recovery than with natural healing alone. Avoiding re-injury to the treatment area is critical to promote proper healing and avoid the return of pain. The ML830 Laser sends light (photons) into your injured tissues and stimulates healing and reduces pain. The low level light has a penetration capacity of approximately 5cm (almost 2 inches) with a 3cm lateral spread into the body without being absorbed by the skin, fat, or blood. As a result, it is the deepest penetrating modality currently available. No heat is generated so it is safe for use anywhere* on the body. Research has shown that these photons are specific in stimulating only tissues that have been damaged, leaving normal tissue unaffected. Changes begin at the cellular level as the light stimulates the mitochondria (the power source of our cells) of damaged cells resulting in a cascade of cellular responses. This "photobiostimulation" energizes cells and accelerates the body's normal healing process. Collagen and cartilage production is stimulated and enhanced so that ligaments and tendons grow stronger than with normal healing. This laser therapy treatment does NOT wear off like most medicines, electrical stimulation, heat, or ice. When it reduces inflammation it stays away. It increases your body's own healing power and enhances that process. If you don't re-injure the area, the pain should not return. Treatment with the MicroLight ML830® cold laser is designed to temporarily relieve most muscle, joint, tendon, and nerve pain in the following conditions (a partial list): Carpal Tunnel Syndrome, Migraine headaches, Tendinitis, Bursitis, Plantar fasciitis/heel spurs, Tennis elbow, Osteoarthritis, Low back pain, Sciatica, Neck and Shoulder pain, Post-surgical pain (including total knee or hip replacements, spine surgeries, and rotator cuff repairs), heal Fractures up to 60% faster, TMJ, and Fibromyalgia. Its even safe on children. *Exercise precaution when applying on the thyroid, fetus, or any known cancers. Why Use the 830nm Wavelength? Not all devices are the same. The answer is one of penetration and delivered energy. The goal is to deliver the most effective laser wavelength to the target tissue. After 30+ years of scientific study and clinical research, we know that the 830 nm laser light produces specific beneficial biological reactions that are not produced by other wavelengths. Dr. Noriko Mochizuki et al published a clinical study on the effect of laster therapy and ATP production (see Benefits above). In that study, it was found that tissue levels of ATP were significantly increased when the 830 nm wavelength laser light was introduced to the target area. The study further stated that this beneficial increase was not the result of temperature modification, but rather a direct response to the effect of last light photons. Only the ML830 laser (manufactured by Microlight Corporation of America) is FDA cleared and utilizes the patented 830 nm wavelength proven to penetrate through human tissue for optimal stimulation of the mitochondria to increase ATP production. Treatments last between 5-20 minutes based on the severity of your condition. Most patients will see excellent results after 6-12 sessions. This will depend primarily on the type of condition and the length of time the condition has been present, with more chronic or severe conditions taking longer. Complete improvement of symptoms may take up to 20 to 30 treatments. If your condition does not change immediately, it may take 3-4 sessions before a dramatic or marked change is perceived. For most people, laser therapy is quite passive. There are no pulsating shocks felt, or feeling of heat during treatment as is common with other therapies. The most noticeable sensation is the touch of the probe head coming into contact with your skin. Some patients (3-5% of those undergoing light therapy) have reported a slight tingling or tapping in a nerve or along a nerve pathway. Some have noted that they are able to sense a slight feeling of warmth. Following (and even during) a laser therapy session, approximately 75-80% of patients notice an immediate improvement. ML830 Laser Is Safe, Painless, and Noninvasive. The ML830 has been safely used around the world for over 30 years with great success. In fact, General Motors was part of the original ML830 Laser clinical studies, testing all employees at their Flint Michigan plant who suffered from Carpal Tunnel Syndrome (this was a large group). "GM found it to be 70 to 80 percent effective - nearly 80 percent of the people in the study went back to work, while the other 20 percent experienced some improvement." The ML830 is the world's first FDA approved "3-B Laser" after passing guidelines that include years of clinical studies and tests. The FDA has some of the highest standards in the world. Surprisingly enough, the Laser doesn't generate heat and is approved to be used over metal implants and fractures making it safer than Ultrasound. 1. 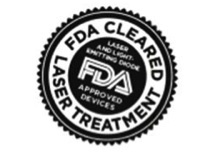 It is safe  as stated in the previous section, the first FDA cleared 3-B laser. 2. Non-invasive  unlike surgery, LLLT does not penetrate the body. There will be no damage to skin, tissue, or muscle and therefore, no recovery time after treatment. 3. Non-toxic  Many doctors prescribe medications for pain and inflammation known as Non Steroidal Anti-Inflammatory Drugs (NSAIDS). As with any drugs, NSAIDS have known side effects due to toxins. LLLT has no toxic effects. 4. Easily applied  the therapy is quick, easy, and painless. 5. Highly Effective  Hundreds of studies have shown that LLLT is highly effective. The FDA has approved LLLT for many issues, such as pain relief, reduction of inflammation, enhanced tissue, nerve, and bone repair. 6. Deep penetration of 5cm (almost 2). 7. Two Medical Double Blind Studies (Baylor & GM). 8. Used in America for over 20 years. nal fees are being charged for this modality when performed in conjunction with chiropractic visits. Don't wait any longer. We've seen excellent results on both recent injuries and those who have dealt with chronic pain for 15 years!